Introduction: Laparoscopic pancreatic surgery has gained acceptance but few data are available concerning the long term results. Aim of this study was to evaluate the safety and long term results of the laparoscopic approach for treatment of non-malignant pancreatic lesions. 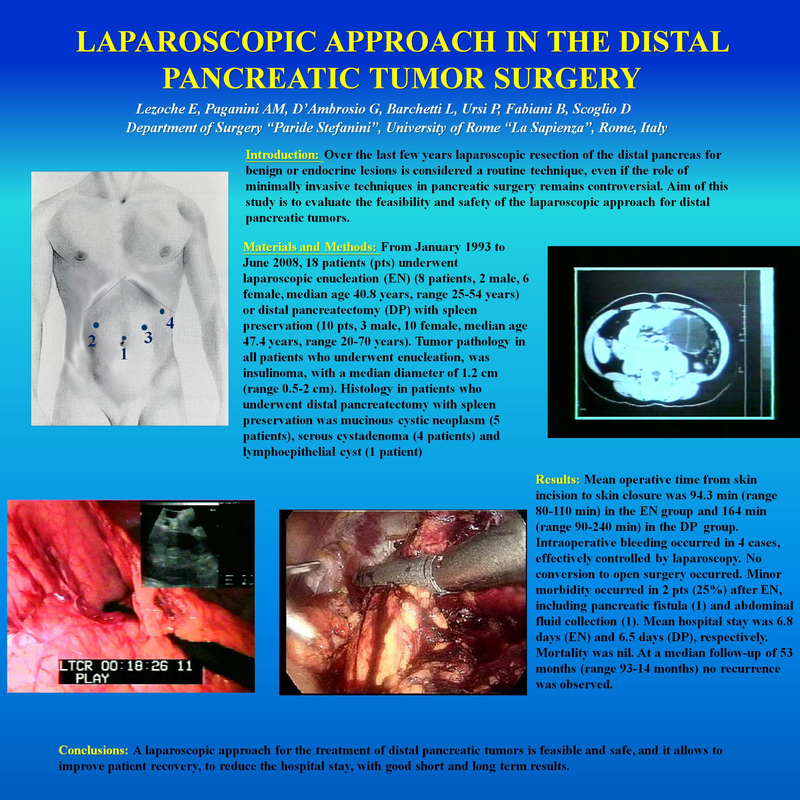 Materials and Methods: From January 1993 to June 2008, 18 patients (pts) underwent laparoscopic enucleation (EN) (2 males, 6 females, median age 40.8 years, range 25-54 years) or spleen-preserving, vessels-preserving distal pancreatectomy (DP) (3 males, 7 females, median age 47.4 years, range 20-70 years). Tumor pathology in 8 patients who underwent enucleation was insulinoma (median diameter 12 mm, range 5-20 mm) and in 10 patients who underwent distal pancreatectomy it was mucinous cystadenoma (5), serous cystadenoma (4) and lymphoepithelial cyst (1). Results: Mean operative time from skin incision to skin closure was 94.3 min (range 80-110 min) for EN and 164 min (range 90-240 min) for DP. Intraoperative bleeding occurred in 4 cases, controlled by laparoscopy. No conversion to open surgery was observed. Morbidity occurred in 2 patients (11%) after EN, including pancreatic fistula (1) and abdominal fluid collection (1). Mean hospital stay was 6.8 days after EN and 6.5 days after DP, respectively. Mortality was nil. No patient was lost to follow up. At median follow-up of 120 months (range 15-192), no local or distant recurrence was observed. Conclusions: Laparoscopic pancreatic surgery for non-malignant lesions confirms its safety, also at long term follow up.